Back in the day, before say, the rise of African American literature courses and the formation of black literary studies, English teachers and their students were less likely to cover varieties of black poetry and poets. The "token" black poets in the anthologies and on the syllabi were used as stand-ins for all black poets. Today, in many contexts, we're often led to wonder: What are some differences between black poets and black poets? What differences do those differences make? In literature courses that concentrate exclusively on black writers, divergences among African American poets drive general and scholarly conversations about the poetry in ways that were less likely when folks studied one or two black poets at a time. In courses that highlight 10 or 20 or 30 black poets, the differences take on added significance. Does any us -- folks into the work -- confuse the poetry of Langston Hughes, Margaret Walker, and Rita Dove? Or, the poetry of Tracie Morris, Tracy K. Smith,and Patricia Smith? 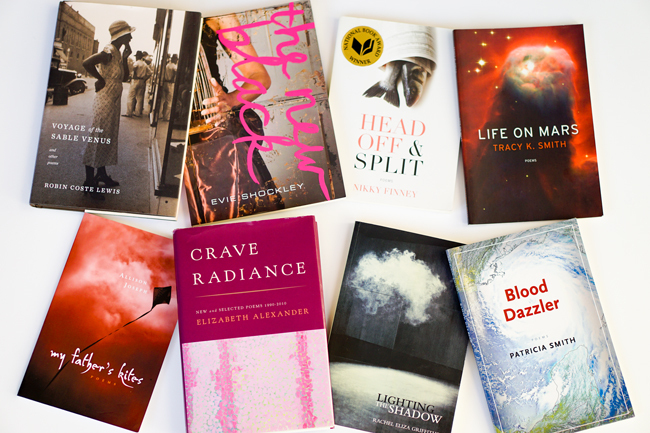 The poetry of Nikki Giovanni, Sonia Sanchez, Kevin Young, Terrance Hayes, and Tyehimba Jess? Nope.Hardly ever. Listen: many of us even make distinctions between the poetry of early LeRoi Jones and late Amiri Baraka. The expansive production of poetry -- in print and on Youtube -- over the last decade alone places all kinds of demands on our abilities to discern between black poets and black poets. You hear folks discussing "academic" black poets as something quite different from spoken word poets. And of course, those so-called academic poets are constantly noting the differences among writers in their field, just as spoken word folks point out the varieties of spoken word. In some genres, the primacy of African American creators is the standard. There's no need to speak of "black rap music" or "black jazz," since so many black practitioners were instrumental to the formation of those fields. There might be some tokens in rap and jazz, but they ain't black. Within fields of black poetry, we're still finding our way in talking about the differences without losing sight of the links. We try to talk about this seemingly unified thing called black poetry, even as we acknowledge all these debates, tensions, diversities, and divergences within the field.